Blackjack switch is a newly created version of traditional blackjack which was invented in 2009 by Geoff Hall. Geoff Hall was a card counter who became frustrated at being dealt two weak hands at the blackjack table. Hall then developed his idea and in October 2000 took his new blackjack product to the G2E conference in Las Vegas. Hall exhibited his product and in early February 2001 saw its debut in Iowa’s Harvey casino. Hall then realized his version of his favourite game needed modifying. 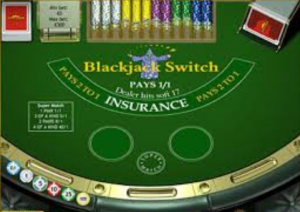 In 2003 Hall introduced the Push on 22 rule and that when Blackjack Switch took off to become one of the most played versions on land based and online blackjack. Four Queens Casino immediately installed Halls blackjack variant into its casino as well as leading online software provider Playtech. Blackjack Switch is played with 4, 6 or 8 decks each containing 52 cards which are then shuffled together and dealt from a shoe or card shuffling machine. The Blackjack Switch table is near enough the same as a traditional blackjack table however instead of one box, each player has two boxes. The player then places his/her wager which has to be the same on both boxes and the cards are dealt. The dealer gives each player a face up card and then deals him/herself a face up card, then a further card to each player. The dealer then asks each player if they would like to swap their top cards. Example: If the player is dealt 10-5 on one hand and 6-10 on the other the outcome after switching cards could be 10-10 and 6-5. After the player makes his or hers decision to switch cards or not, the dealer then asks the player if they would like to hit, stand or double. Gameplay rules are the same as traditional blackjack; going over 21 means the player is bust however the dealers hand can reach 22 meaning that instead of going bust it’s a push. In most cases deciding to switch or not is quite obvious however some hands are not so obvious. Below the Blackjack Switch chart gives recommendations on what action to take given the cards dealt. Online Blackjack Switch normally offers side bet options which involves the player making a further wager on the cards dealt. This side bet is called Super Match and offers up to 40/1 for 4 of a kind, 8/1 on 2 pairs, 5/1 on 3 of a kind and 1/1 for a pair.